Sheet pan dishes are so convenient, especially on our weeknights. 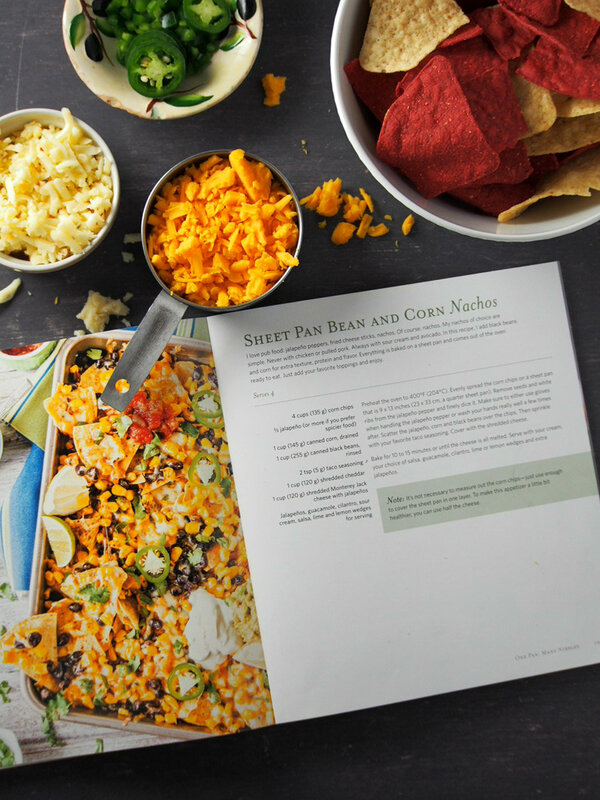 This Sheet Pan Bean and Corn Nachos is just one of the easy and delicious recipes from Julia Konovalova’s “The Ultimate One Pan Cookbook”. 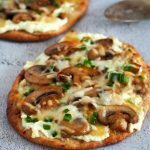 It is a tasty, flavorful snack or appetizer that cooks together in one pan and that the whole family can enjoy. Having the opportunity to review The Ultimate One-Pan Oven Cookbook is such a timely thing for me. First, because we just recently bought a countertop oven for our basement so I can bake away more conveniently in the same place where I prepare ingredients and take photos, and second because I am loving sheet pan recipes lately. Sheet pan meals, oh my gosh. Don’t even get me started. I bake a lot, yes, and if I can bake our meals in the oven too, and if it is one pan and walk- away assembly, then that is a double yes for me. 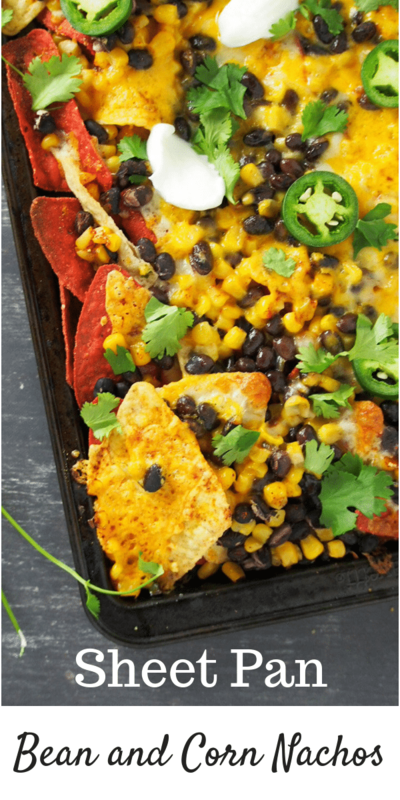 This sheet pan bean and corn nachos is a perfect example of a one-pan assembly that you basically put in the oven and then walk away. 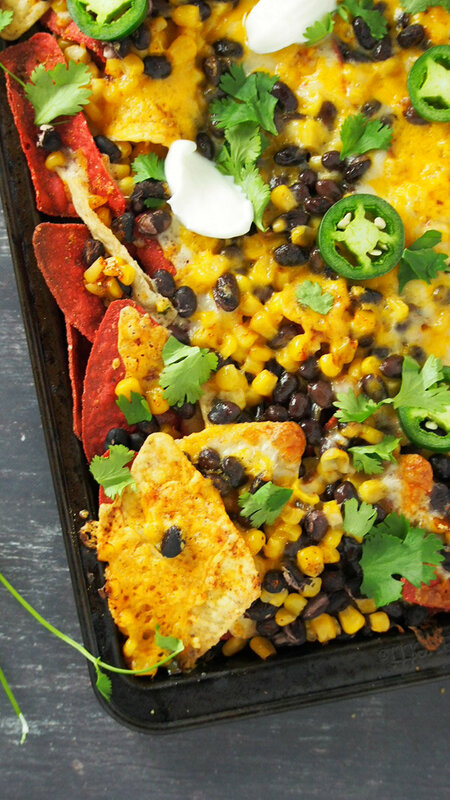 I place the ingredients in a pan, bake them and in 15 minutes we were munching on these tasty nachos, watching two episodes of our show in a row- a thing we only do on weekends. But because there is nachos without a sweat, we have lots of time on our hands so it definitely felt like the weekend. Win-win. Julia, the author of the cookbook crafted delicious one-pan recipes that I am totally so excited about. 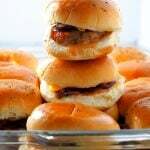 Being of Asian descent, I grew up around cooking that involves multi-steps and procedures. We love to sautee first or to boil things first, things like that. Don’t get me wrong. I love Filipino cuisines and the depth of the flavors from the multi-cooking steps. But sometimes, my life needs something where you put everything in one pan, cook them once and dinner is done. Don’t you feel like you need that in your life too? And you won’t even compromise flavor, that is a guarantee. Aside from this loaded, tasty bean and corn nachos, I also tried the Spicy Blackened Chickened Legs with Sweet Potatoes and Broccoli, and man, there is some real depth of flavor going on there. 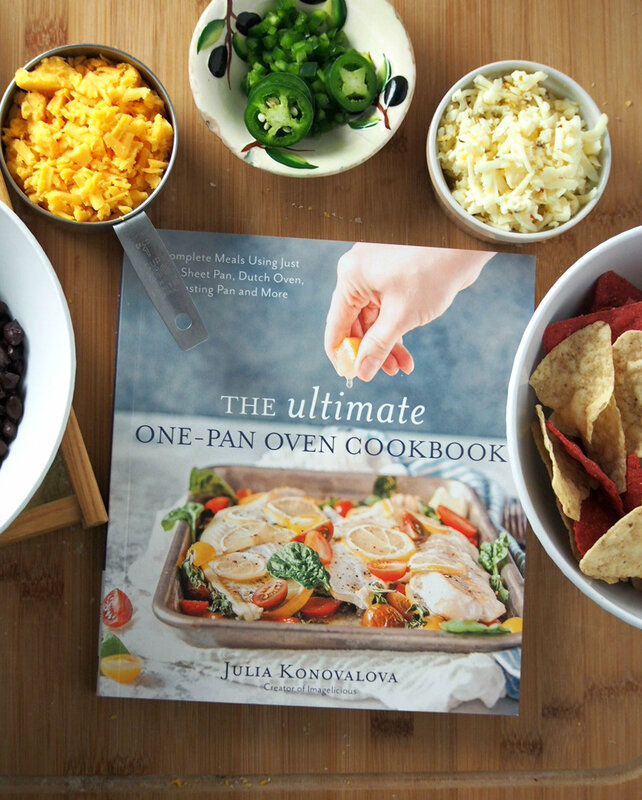 And that is what I love about sheet pan meals, and in this book, Julia perfectly put together recipes that pack flavor by way of using tasty, flavorful marinades and sauces, and also by using simple ingredients and accenting flavor with herbs and spices. I am totally loving this new gem. Personally, I am excited because the dishes in the book showcases diversity in flavor. 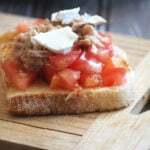 Some are sauce-based, while some rely on simple lemon juice, olive oil, butter and herbs to highlight the main ingredient. All of them appeals to me. 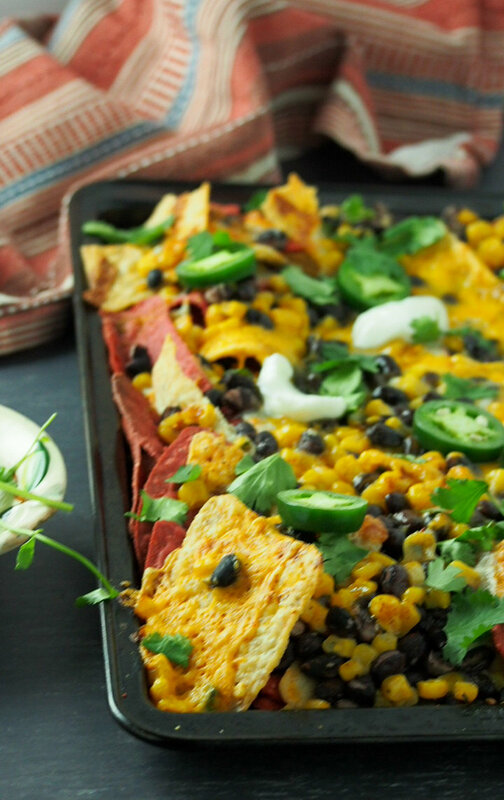 You have to try this easy corn and bean nachos and see for yourself. The meaty beans and corn, the melty cheese and the bright and fresh cilantro highlight the crispy chips perfectly. Your family will consume the entire pan-full in no time. In other words, endless. You will be delightfully overwhelmed with the many dishes you can cook in one pan, be it breakfast, lunch, dinner, dessert or snacks. You are covered. That is why this book is a new joy to me. It is definitely welcome in my life. And with that, I will see you again next week. Meanwhile, I will be here, totally breaking in my new oven, baking bread and feeding my family The Ultimate One-Pan Oven Cookbook, basically. 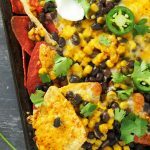 Sheet Pan Bean and Corn nachos is such a flavorful appetizer or snack that is so quick to prepare. 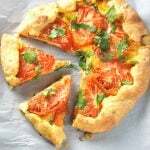 Your whole family can enjoy this even on weeknights. Preheat oven to 400 F. Spread the corn chips evenly on a sheet pan that is 9 x 13 inches in size. Remove the white ribs and seeds of the jalapenos and dice them finely. Use gloves as you handle the jalapenos or wash your hands after. Sprinkle the diced jalapenos all over the corn chips. Scatter the corns and beans all over the chips too. Sprinkle the taco seasoning. Cover everything with the shredded cheese. Bake for 10-15 minutes or until the cheese has all melted. Top with cilantro. Serve with either guacamole, salsa, or sour cream, more jalapenos and lemon/ lime wedges. The corn chips do not need to be measured out. Just use enough to cover the pan in one layer. 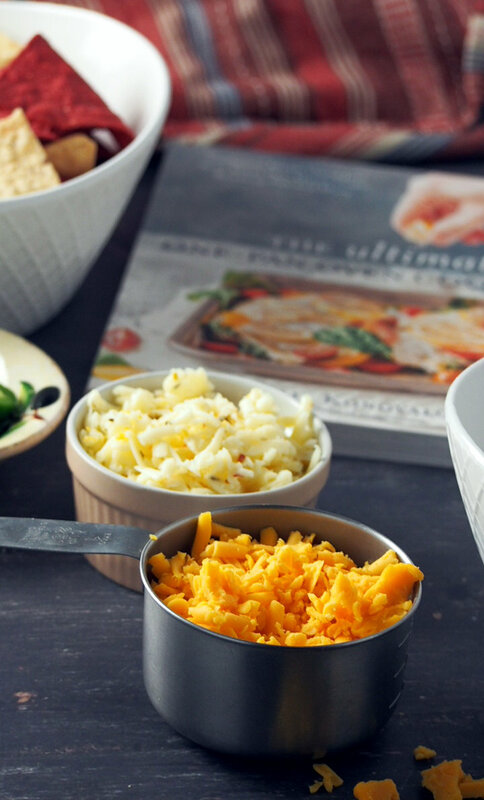 Recipe from The Ultimate One-Pan Oven Cookbook by Julia Konovalova of Imagelicious. Disclosure: I received a copy of The Ultimate One-Pan Oven Cookbook for review, but not compensated. All opinions are mine. Excerpted from The Ultimate One-Pan Oven Cookbook. Copyright © 2018 Julia Konovalova. Published by Page Street Publishing Company. Reproduced by arrangement with the Publisher. All rights reserved. Thank you so much for your lovely review! 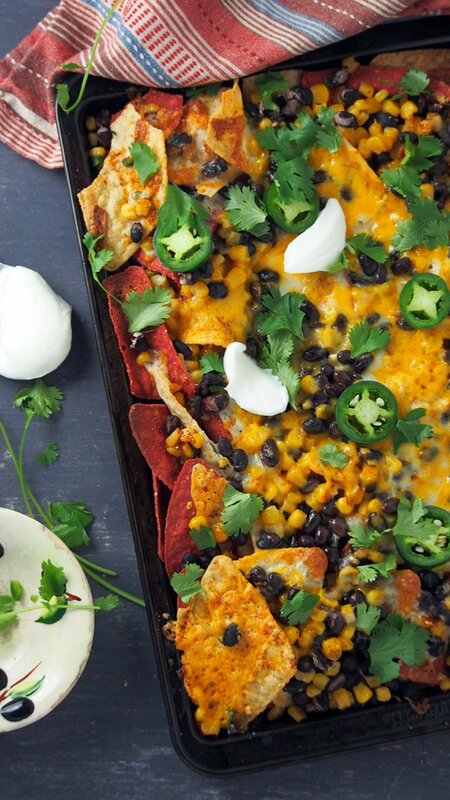 I love these nachos as they are so easy! And I love your photo that perfectly mimics mine 🙂 Very cute! Thank you, Julia. I have been cooking from your book this past week. We had this nachos twice in a week So, so good!